This is an article worth reading. 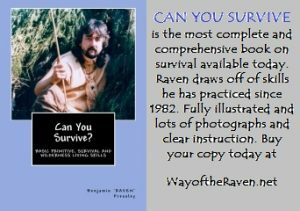 It describes a chance encounter with a people living in New Guinea’s highlands that still make and trade stone axes in almost complete isolation from the outside world until 1984 when a German doctor met them while on an expedition in the area. 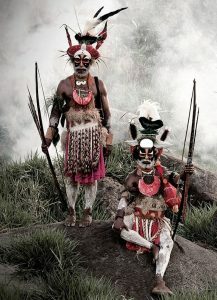 These people, who call themselves the Kim-Yal, are horticulturalists who live in Langda village in the central mountains of Irian Jaya, western New Guinea. Their language belongs to one of the many Papuan families, they call Uni. 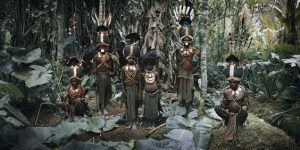 The average Kim-Yal man stands about 4 feet 6 inches tall which is much shorter than populations who live in the central highlands and the southwest coast. They cultivate sweet potato and taro root, raise pigs, chickens and supplement their diet with wild plants and small game. They clear a new field by felling trees and chopping out the residual roots with their stone axes. However, these implements are slowly yielding to imported metal axes and it is estimated that their stone implements will give way and disappear within a few short years as stores providing metal tools are introduced in the highlands and mountains and a cash economy replaces the traditional system of barter. 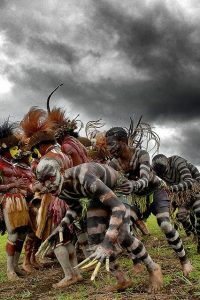 Given that none of the younger members of the tribe are currently apprenticed in this craft, it is likely that most of this skilled axe-making technology will be lost within one or two generations. An archeologist would normally classify the type of ax they make as an adze. The blade is shaped and hafted in such a manner as we would define an adze; however, it is used to chop wood and fell trees and such implements are generally classified according to their use rather than their design. The craft of ax making confers high status to the male specialists who practice it and to their sons who traditionally learn the work in lengthy apprenticeships. Today every man at Langda owns at least 2 stone axes and each woman at least one. Most children older than five years old also tote an ax to the fields where they work alongside their elders. This article describes very well the entire process these people use to produce their fine blades with the expertise of an experienced flintknapper. I am including the line drawings from the article below that illustrate the process very well. The article itself describes the process in detail. 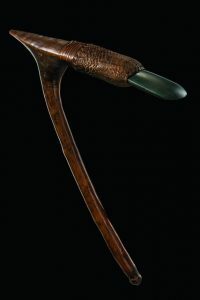 It was interesting to me that the entire reduction process was done with hammerstones decreasing in size and weight the finer the work became and the closer to the finishing stages, rather than using wooden or antler billets and flaking tools. Typically the Kim-Yal ax maker started with a large stone hammer 25 cm (10 in) in diameter swinging it at a boulder through their legs much like the motion of an American football center. It was noted in the article that to their knowledge this technique has never before been described ethnographically, although it could have been used in antiquity for detaching such large flakes. They also produced suitable flakes, sometimes by throwing one boulder hammer against another boulder core or by kindling a fire alongside a boulder to initiate fractures. A typical blank measures 24 cm long, 14 cm wide and 7 cm deep (about 10 x 6 x 3 inches). The final product of flaking is a long, thin ax with nearly parallel sides, a triangular cross section and a bit end having a slightly convex outline and an edge beveled at about 50 degrees. A typical ax measures about 20 x 4 x 3 cm. The time spent flaking from quarry blank to ready to grind varies from 30 to 50 minutes. Between 10 and 20% of the blanks tend to be lost to breakage. After final flaking, the ax maker grinds the working end against a wetted slab of fine grained sandstone. An hour or so of grinding turns out an ax head with a polished bit and an extremely regular edge. Grinding a tool that already has a razor sharp edge helps the tool hold the edge longer and then makes it more ready to be re-sharpened which is also done by regrinding the edge. 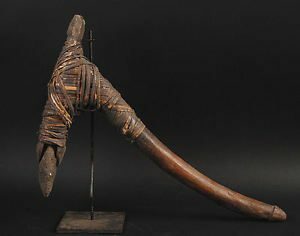 After hafting onto a T-shaped wooden handle at about a 45 degree angle, a Langda villager can fell a tree as thick as a telephone pole in five to ten minutes. 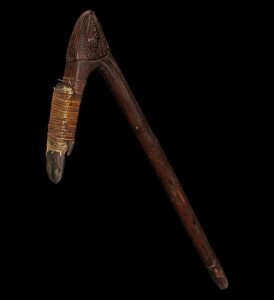 The article also mentioned other tools used by Langda villagers such as small, flat, slate knives that are oval, kidney or subtriangular in shape, and are used to cut off leaves, or split and scrape taro root. They also used split bamboo knives for butchering pigs. They re-sharpened the latter by simply tearing off a strip of bamboo with a thumbnail or with their teeth. 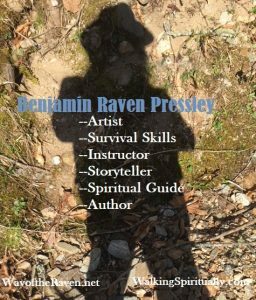 I hope you get this article and read it for it has much more than space allows me to review in this short article. 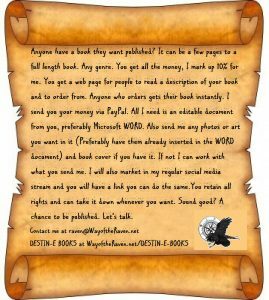 You can get it at the local library or purchase a downloadable version HERE. YOU MAY ALSO BE INTERESTED IN A PREVIOUS ARTICLE I HAVE WRITTEN FOR THIS WEBSITE CALLED ‘CELTS AND ADZES’. 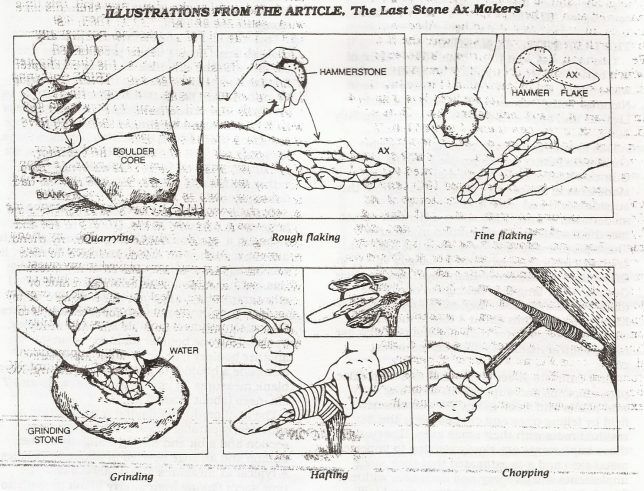 LOTS OF GOOD INFORMATION THERE ON MAKING YOUR OWN STONE AXE, CELT OR ADZE.